Intravenous catheters can be frustrating things. When I was working in the emergency clinic, almost every patient we admitted had to be put on a drip, so back then I got quite good at inserting them. Nowadays it seems a bit more hit and miss. There’s a definite pattern though. If I’m on my own, generally I can get them in without too much problem. Under the benevolent gaze of Magnificent Magne or Jan-Arne, it’s usually not too difficult. But both Dagny and Wivek make the thing look so simple that I seem to go to pieces whenever they are watching. Dagny doesn’t even have to be watching. She only has to be in the room for the difficulties to take effect. Early on Tuesday morning, Dagny had all her kit laid out for an operation and (tactfully) wasn’t watching me in my attempts, but stood chatting to one of the other staff. The dog was a dachshund, and its legs were so short, that even after I had shaved quite an extensive area of its foreleg, its body hair was so long that it obscured almost everything. With shoulders that were becoming decidedly tense already, I selected the smallest possible catheter and took aim. Slipping the stylet through the skin, I was encouraged by seeing a tiny droplet of blood moving up into the breach. Quickly, I slid the needle a nanometer further in… and the bleeding stopped. I had gone right through. Trying to keep my breathing steady, I withdrew a little, but it wasn’t to be. I decided at that point upon a tactical withdrawal. Often it is better to start again with a fresh catheter, which can’t be blocked and hasn’t been blunted by its first traverse through the skin. Selecting a slightly bigger catheter (sometimes this works better as they are less flexible) I set the tourniquet back in place to raise the vein and once again tried heroically to keep the hair out of the way with the final two fingers of my left hand whilst still stabilising the vein between my finger and thumb. This time, the catheter went into the vein, but when I tried to slide the sheath down off the stylet, it just bent. Through all of this, Dagny had been carefully not watching, but I could tell she wanted to get on. I confess I was relieved as she finally elbowed me out of the way and did it herself. A few moments later, with the catheter triumphantly in place, she looked around for the laryngoscope so that she could put the tube into the trachea for the gaseous anaesthetic but it wasn’t there. Ever efficient with her cleaning, Irene had already tidied it away. A little later, and another dog, this time a little pug dog (or mops, as they are called here). This one was having its corneas treated with the cryoscope. Marita came into the room and began to ask Dagny about the freezing effect, and how strong it was. Ever the scientist, Dagny thought it would be a good idea to try it on herself. She held it against the back of her hand for a moment. ‘It’s not sore,’ she announced airily, and moved the tip to a different place with a smile. Jan-Arne managed to injure himself this week as well. On Wednesday, he had taken a biopsy and opened up the small container filled with formaldehyde that would preserve the sample while it was sent to the laboratory. With an aim that he presumably couldn’t recreate, even if he tried, he managed to drop the sample into the pot in such a way that some of the formalin splashed up into his eye. After much salt water washing, he was packed off to the doctor’s to get it checked over. Fortunately there was no permanent damage. He has though, been evilly trying to tempt me with birthday cake all this week. He brought in the leftovers on Tuesday. Heroically I managed to resist. I’m not really sure how many birthday cakes one person needs, but he seems to have been very well supplied. Then again, he’s so generous to everyone that he deserves good things in return. 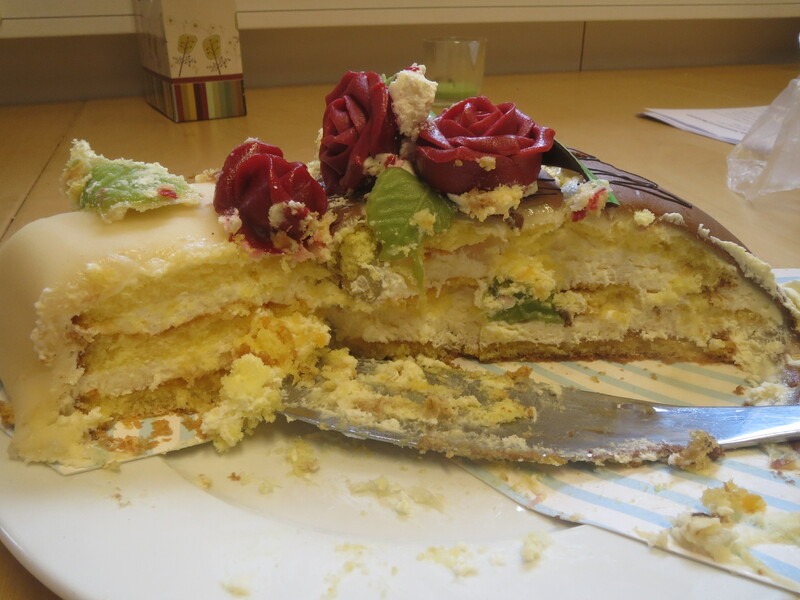 The remnants of the cake were still there on Thursday, but I confess I found it much easier to abstain. Also, someone had brought in a pack of freshly baked boller. Boller are widely available in Norway. They are a kind of sweet bread roll or bun, often with raisins or chocolate chips inside. These ones had bits of Smash: chocolate with caramel and salt. After taking one and eating it, Irene announced that she had discovered a new taste sensation. Jan-Arne and I, both foodies, were looking at her very intently. There was wonder in my head. Specifically I was wondering whether such a combination could possibly be delicious or whether Irene had finally lost the plot. I hadn’t come this far with my resistance to eating extraneous sweet things lightly however, and somehow I managed to curb my enthusiasm towards this idea. ‘You could design a new boller,’ Gerd offered. ‘An Agurk Boller.’ (Agurk being Norwegian for cucumber). ‘What’s English for boller?’ Irene asked. And so the CucumBun was born. At least it will be, when someone takes the time to make it. Todays picture is Chika who was in for her first vaccination.